Introducing the KING Quest antenna. Take your DIRECTV® Satellite TV Service anywhere in the continental US! 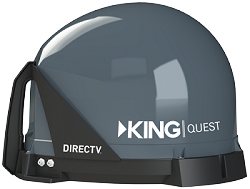 Use the KING Quest as a portable satellite TV antenna or permanently mount to the roof of your RV. This small, easy to use, fully automatic antenna gives you the freedom to take your favorite DIRECTV programming with you on the road, to the great outdoors, or anywhere in between. Not compatible with SWM only receivers. DIRECTV satellite service required. For stationary use only. Limited Mfr Warranty: 2 year parts and 1 year labor. Made in the USA. *Does not receive DIRECTV HD programming. Not compatible with DIRECTV Ka band satellites or SWM only receivers.